Environmental awareness and social mobilization is a growing issue in Latin America. 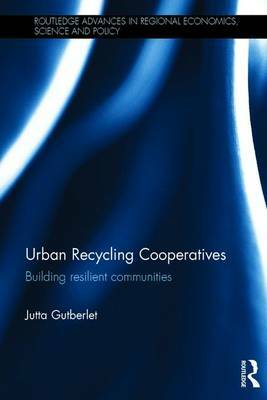 This book discusses how co-operative recycling practices have been increasingly used as a strategy to contest both the waste problem and urban poverty. Selective waste collection and sorting materials out of the garbage stream has become a widespread survival strategy for the economically excluded population. While severe and chronic occupational health problems and risks are very common among the recycling workers, thousands of people exclusively depend on accessing these resources. By examining experiences from Brazil and other Latin American countries, this book questions what can be done to improve the environment and livelihoods for these excluded citizens, examines the specific health and risk implications and looks at the many innovative recycling co-ops and associations which have recently emerged, creating an exciting new form of solidarity economy. In doing so, it uncovers the landscapes of despair populated by the urban marginalized, but also the landscapes of hope, where solidarity and collaboration make a pathway to a better way of life. Buy Recovering Resources - Recycling Citizenship by Jutta Gutberlet from Australia's Online Independent Bookstore, Boomerang Books. Dr Jutta Gutberlet is Associate Professor and Director of the Communities Based Research Laboratory in the Department of Geography, University of Victoria, Canada.